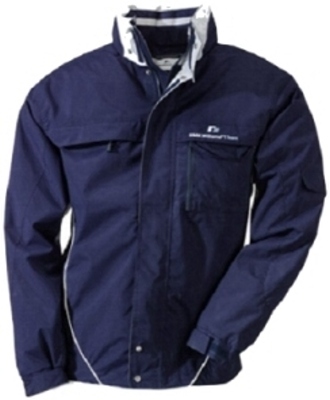 BMW Williams F1 Performance Windbreaker, Casual. Blue windbreaker with grey inserts, removable zipped hood with drawstring and Velcro fastening at the top. Various inside pockets and ticket pass holder; pocket on left chest; two zipped pockets on chest and left sleeve. Sleeve finishing with dark blue cuffs and blue Velcro fastening. BMW Williams F1 Team logo on left breast pocket and collar. Outer fabric: 100% polyester Oxford, Milky Coating, Water column 3000.